Lewis Bartholomew of Courtenay could be called a memory keeper for a part of Port Alberni’s maritime history. COMOX –Lewis Bartholomew of Courtenay could be called a memory keeper for a part of Port Alberni’s maritime history. Bartholomew became capitivated with the story of the HMCS Alberni, a Canadian Corvette that sank after a German U-boat attack in 1944, after he saw a photo of it. He created a mobile display of the ship and corresponding information about its occupants. 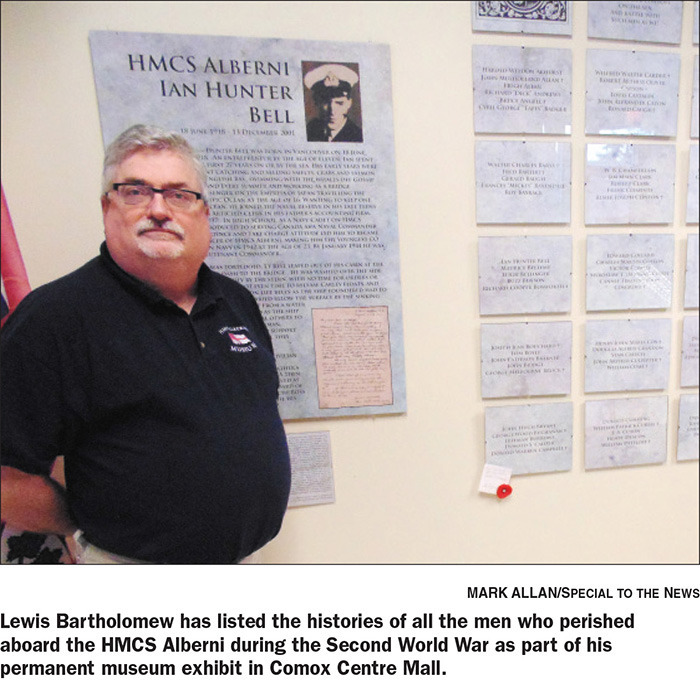 In late 2013 he opened a permanent museum display in Comox Centre Mall, with the HMCS Alberni as the focal point. The increasingly popular HMCS Alberni Museum and Memorial is in slightly better financial health these days. 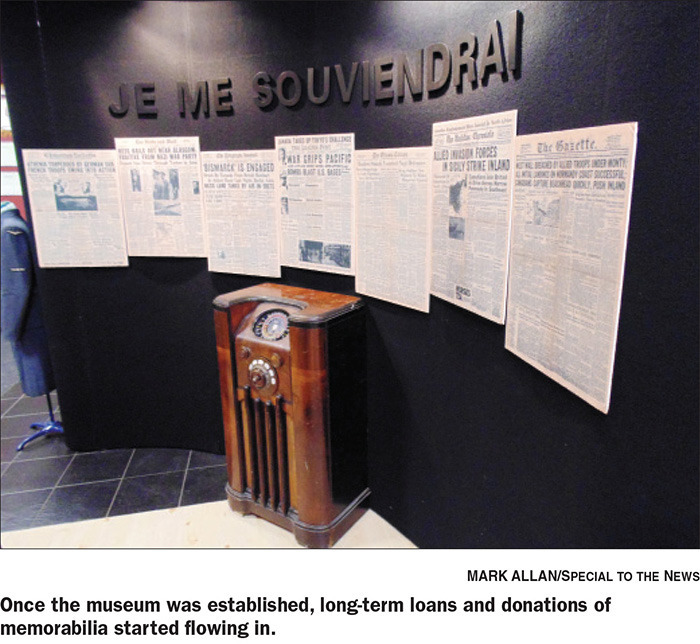 Yet even after a welcome $2,500 one-year grant announced recently by the Town of Comox, curator Bartholomew says the museum can always use more monetary donations and volunteers. Bartholomew, who has spent thousands of dollars from his own pocket since 2000, has filed other funding applications he hopes will result in more funding. More than 5,600 visitors toured the museum and saw its mobile displays last year, he said. Up from about 2,400 in 2013, that’s a 133-per-cent increase. The Alberni Project founder will address the Port Alberni Maritime Heritage Society and Royal Canadian Legion Alberni Valley Branch 293 on Thursday, March 26 in what is being billed as a Maritime Heritage Night. Bartholomew will speak about the story of the HMCS Alberni and how he was intrigued 15 years ago when he saw a painting of the Canadian Corvette on a BC Ferry. He was particularly captivated by the dramatic tale of how all aboard were lost when the ship (named for Port Alberni) was sunk by a German U-Boat in 1944 near the Isle of Wight. For reasons the native American and converted Canadian still cannot fully explain, Bartholomew made it his mission to found the Alberni Project to commemorate the seamen who gave their lives for Canada. Once the Alberni Project established a public awareness critical mass, donations, long-term loans of wartime artifacts begun to flood in. That necessitated a storefront, which became HMCS Alberni Museum, or HAMM, at Comox Centre Mall. Not counting its mobile displays, HAMM has a little under 2,000 square feet of exhibit, office and archive space. As a registered non-profit society, The Alberni Project Society’s goal is to collect, interpret, display and preserve the history of Canada’s role in the Second World War and to convey the personal stories and events of a global war. In a remarkably even-handed gesture, plaques near the HMCS Alberni Museum’s main entrance contain not only the names of everyone who ever served on HMCS Alberni but also the name of every man who served on the U-Boat that sank the Canadian vessel. “Some people call us a war museum,” Bartholomew noted. “We’re not exactly a war museum. We’re about the stories of war. The Alberni Project executive director will speak March 26 from 7–10 p.m. at the Royal Canadian Legion at 4680 Victoria Quay in Port Alberni. To learn more visit www.alberniproject.org or phone 250-339-4322.